Tax returns and an oligarchic presidency. Now, it may bug some that the quote is from Buckley’s publication. That doesn’t bother me as much as the fact that NRO’s argument was gleefully parroted without examination. The “tricks” in question are deductions for state taxes, charitable contributions, mortgage interest and job-related expenses. If deducting state taxes on your federal return is considered a “trick” and is going to be used to bludgeon Bernie, then we are reaching the wrong conclusions from the returns candidates disclose. I’ve seen snide comments about the Sanders’ effective tax rate popping up in discussions, along with repeated broadsides about “why won’t he release his returns”, followed by “he’s only released one year of returns” and “where are the rest”. Bernie has released his and Jane’s 2014 tax returns, and what I’m going to do here is review that alongside the Clinton’s 2014 return and discuss what they reveal about our political system, tax regime and this election cycle. If Bernie is out of the race, Clinton or Trump will be president. With near certainty, the White House will be occupied by a person with oligarchical levels of wealth and income. Once you understand that, the attacks about Bernie’s returns, tax rate and deductions look very much like swift-boat style attempts to attack his strengths and distract attention from his opponent. So what does an oligarch’s tax return look like? The Clintons income of $28 million for 2014 is 136 times Sanders’ income for the same period. And the Sanders are doing pretty well, they had income and Social Security benefits that totaled over 200k last year, putting them in the top 5% of Americans. However, the Clintons’ income of $28 million place them in a different league entirely. The numbers may seem abstract, so I’ve graphed them on the right. Sanders’ income is less than 1% of what the Clintons made in 2014. Where did that $28 million come from? What Hillary tells captains of industry is none of our business, even if her administration would be responsible for regulating them and setting tax policy. The second belief should be rejected out of hand. Bernie is right to ask why so many large enterprises (particularly in Finance) believe it makes sense to spend 250K on a speech by Hillary. The hollowing out of the middle class. More than four-fifths of US urban areas have seen declines in household income since the turn of the century, according to research that exposes the middle class decline at the heart of this year’s presidential election campaign. It reveals a steady erosion of the middle class across the US map, with 203 out of 229 metro areas experiencing a decline in the share of their populations that are middle income. At the same time, 172 metro areas saw increases in the share of their population that is upper income, and 160 saw a rising lower-income share. This isn’t some commie-socialist rag raging on about the oligarchy. It’s on the front page of the Financial Times, the daily read of the global banking elite. My peers know the American middle class is being hollowed out. We know the US now has levels of inequality greater than those in India and much of the developing world. The question is whether the electorate will allow itself to be distracted from these very real issues by manufactured controversies. What’s the story with tax rates? For half a generation (15 years), 80% of urban areas in the US have seen nothing but declining incomes. AGI is line 37, Itemized Deductions are line 40, Taxable Income is line 43 on the 1040s. I’ve halved the Clinton’s self-employment tax (line 57), since for Sanders employer pays half of his Social Security and Medicare (which I calculated based on reported wages/salary of $156,441). State/Local/Real-Estate taxes are from Schedule A. The Clintons pay a higher tax rate than the Sanders in general. But that’s to be expected, their income is 136 times Sanders’. That’s what a progressive tax system is supposed to accomplish. Do note though that Sanders’ state/local and payroll tax rates are higher. That’s to be expected as well, since these tax schedules are often regressive. Looking at federal income tax rates alone doesn’t give you a good sense of the relative impact of taxes on the incomes of average Americans or the well-off versus the truly very rich. The percentage tax rates are also a bit misleading because of the huge disparity in income. Small exclusions have huge impacts on Sanders’ tax rate, and almost none on the Clintons because their income is so insanely high (they are among the top 5,000 tax returns in the US, or 0.005% of taxpayers). The standard exemption for married couples is $7,900, that’s 4% of Sanders’ income. It is 0.028% for the Clintons. The Clintons deducted $41,883 in mortgage interest, that’s 0.15% of their income. Sanders deducted $22,946 in mortgage interest, that’s 11.17% of their income. Oh yeah, and charitable contributions. The Clintons gave $22,700 to unaffiliated charities. That is 0.08% of their income. * The Sanders gave $8,350 or over 4% to charity. I do want to point out that all my calculations have somewhat understated the gulf between the Clintons’ income and Sanders’. There are 5 million tax-payers/households who have incomes higher than Bernie. Perhaps 4,000 tax returns showed more income than the Clintons. ** That’s among 147 million joint and individual tax returns (I’m using 2013 stats on tax returns since the IRS hasn’t published 2014 yet). If we compared the US to a city with 100,000 households, the Sanders are pretty well-off, only 3,700 people made as much or more than them in 2014. They’re comfortably in the top 5%. The Clintons on the other hand, are one of the three highest-earning households in our fictional city. They’re in the top 0.003%. And as the Pew Research demonstrates, the middle class has been hollowing out over the past 15 years. The top three families though, have seen their incomes rise greatly. Income inequality by the numbers. It’s tough to visualize such disparities, but let’s try. In the graph at the right, all the blue boxes are tax returns with AGI under 50k. Orange is AGI between 50k and under 200k. Sanders squeaks into the green box by a hair, that’s 200k to 500k. The remaining little multi-colored boxes are AGI over 500k. That last little red box at the bottom right is tax returns over $10 million. That red box contains 12,839 returns out of the grand total of 147,351,299. Only 0.0087% of tax-payers make it into the red box. That is where the Clintons fit in, somewhere in the upper end of that box, with $28 million. Trump is a few notches above them with estimated income of $160 million. Forget the population at large for a minute and let’s just compare their political peers. Sanders is among the poorest 20% of Senators. The Clintons are far and above the wealthiest ex-presidential couple alive. At $110 million in net worth, they are five times wealthier than the next, George HW Bush, who’s worth about $23 million. Or put in another way, the Clintons made as much from giving speeches in 2014 than George H. W. Bush is worth. Look, this is a lot of detail, and your eyes may be glazing over. But I’m delving into it because I believe it’s blatant swift-boating to make a fuss about Bernie’s tax returns and tax rates while dismissing the fact that Hillary made 50 times as much from giving speeches to various industries. She won’t release the transcripts for those speeches, but some around here want us to believe that $25,000 in mortgage interest on Bernie’s tax returns is more problematic than $10 million in speaking fees? If that is not a calculated distraction, I don’t know what would be. Let’s set aside the important concerns around time-deferred quid pro quo (speeches/consulting) for a moment. The new normal also means that, in a very narrow sense, both nominees (Trump/Clinton) would have oligarchic levels of wealth and be personally impacted by tax policy in significant ways. They have an enormous personal interest in how our government taxes the extremely wealthy. The highest federal income tax bracket is 39.6%, and it applies to income over $466,950. If a new tax bracket of 50% were created for income above $1 million, it would raise the Clintons’ tax bill by $2 million. Trump’s would go up by over $10 million. That’s real money. In the Clintons’ case, it’s more money than the median American household earns in 40 years of working for 50K a year. In Trump’s case, it would take the median American household 200 years of working to earn as much as that increase in taxes. Who rules? A Blue or a Red Oligarch. I do want to make sure I identify the forest and don’t get lost in the trees. Bernie will lose the Democratic nomination unless we see some unexpected news in a few days. He will likely end up about 200 pledged delegates behind Hillary. This is an amazing result for someone who was unknown to most Democrats when the campaign started last year. If he goes to the convention with 1920 pledged delegates, he will end up 3% behind Obama’s result when he ran against Hillary in 2008 (47.39% vs 50.35%). It is a remarkable run. Are the tree stumps obscuring your view of the forest? But Bernie’s loss would mean the two presidential candidates will be Hillary Clinton and Donald Trump. One has an annual income of $28 million and the other’s is well over $160 million (estimating 4% returns on a reported $4 billion fortune). Take a look at the income comparison on the right, remembering Sanders income puts him in the top 5% of American incomes. When he’s gone, like it or not, our choice for president will be between two individuals who have oligarchical levels of wealth. Keep in mind that we’re discussing income, not wealth. This is money made in one year. Wealth levels are far higher. The Clintons have $110 million, and Trump is likely worth $4,000 million. I won’t dwell on how Trump made his money, we live in a celebrity age and there’s no getting away from the remunerative “value” of personal brands. But I will note that looking at the recent nominees, John McCain ($100 million), Mitt Romney ($250 million), John Kerry ($200 million), we’ve been putting up candidates with oligarchical levels of wealth for some time. Compared to them, George W Bush was almost middle-class ($20 million). Al Gore’s net worth of $1.7 million in 2000 and Barack Obama’s of $1.3 million in 2008 make them relative paupers. Of course, Gore is now worth $200 million, so that ship has sailed. We’d have to go to Bob Dole ($5 million) and Jimmy Carter ($7 million) to get to levels of wealth for ex-presidential candidates that the average person can somewhat relate to. Since 2000, half our candidates have had oligarchic levels of wealth. This year, we may well have no non-oligarchic choice. Look, this is not about demeaning monetary success. I don’t begrudge Trump or the Clintons what they have. This is about whether or not the pool of viable candidates for president (i.e. nominated by one of our two major parties) has to draw solely from the oligarchic class of about 5,000 families. You may think that’s okay. After all, the president is in an even narrow bracket. No one else commands the armed forces of the US, has the nuclear codes, and comes close to wielding as much power. What’s a few tens of millions compared to that. But perhaps it should not be that way. 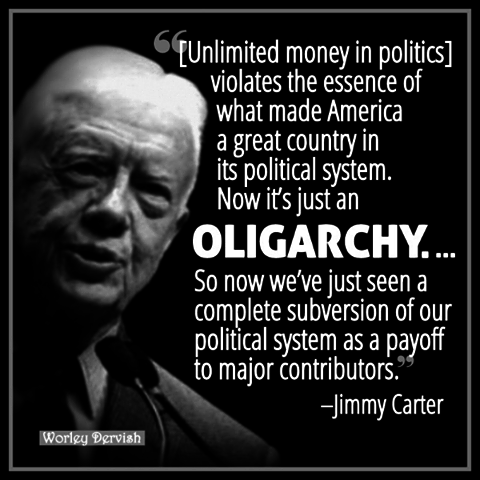 Obama wasn’t in the oligarchic class when nominated. Lincoln certainly was not. Nor was George W. Bush for that matter, he had 896k in income in 2000 (Cheney definitely was, he made $36 million in 2000). FDR, for all his reputation of being fabulously wealthy, had half the fortune the Clintons do (in inflation adjusted dollars). The fact that we see their faces on our TV screens makes it seem as if their lives and cares are familiar to many of us. Yet in reality, we’re talking about levels of wealth, economic security and comfort that are simply in another galaxy from the experience of the average or median American. Perhaps that is what the presidency is meant to be, an imperial office occupied by those who are very removed from the cares of ordinary Americans. Perhaps it isn’t meant to be that way. * Oh yeah, the Clintons also also gave 3 million to their own foundation. Except it’s really tough to separate the foundation from political activity. The Clinton Foundation hosts a lot of summits, conferences and cocktail parties around the world, mostly for folks who’re in the Clinton’s tax bracket. In 2013, they spent more on travel, events and meetings ($38 million), than on the signature program of funding medical supplies via UNITAID ($29 million). The foundation also directs funds to the foundations of influential Democrats and political activists. Many of the donors to their political campaigns cut enormous checks to the foundation. In some ways, it’s an extension of the campaign since many staffers have moved between the foundation and political campaigns. Yes, it does promote many laudable programs, but the foundation serves as a platform for the Clintons and their political allies to get in front of wealthy individuals, many of whom donate to the political campaign as well. It also pays for a lot of travel for the Clintons. In any case, I’m not going to count it as a charitable contribution. It’s something in between, kind of like the fact that Bernie helped pay for his niece’s wedding. You may wish to argue over it in the comments. The 1% is pretty stratified as well. ** I’ve charted the top 0.70% to the right, it’s not the top 1% because I used 500K as the income cut-off (using IRS tax data). There were 1.07 million tax returns with AGI above 500K. But most of them are irrelevant when analyzing the Clinton or Trump figures. The top 12,839 returns showed income of roughly 375 Billion. Each of them showed income above $10 million for 2013. But 106 Billion of that was on the 400 returns showing the highest AGI. IRS doesn’t give you the distribution, but the average was 265 million, so $100 million in income as a lower bound for being in the top 400 is probably a good guess. That means the remaining 12,439 returns average $21.667 million each. We know that distribution is skewed too, so with $28 million in income, the Clintons are likely in the top third, that places then safely within the top 4,000 returns. Trump is probably in the top 400 returns. Previous Previous post: The medium is the message. Next Next post: NYT headline/article is indefensible. So is DailyKos FPers’ red hot take on it.